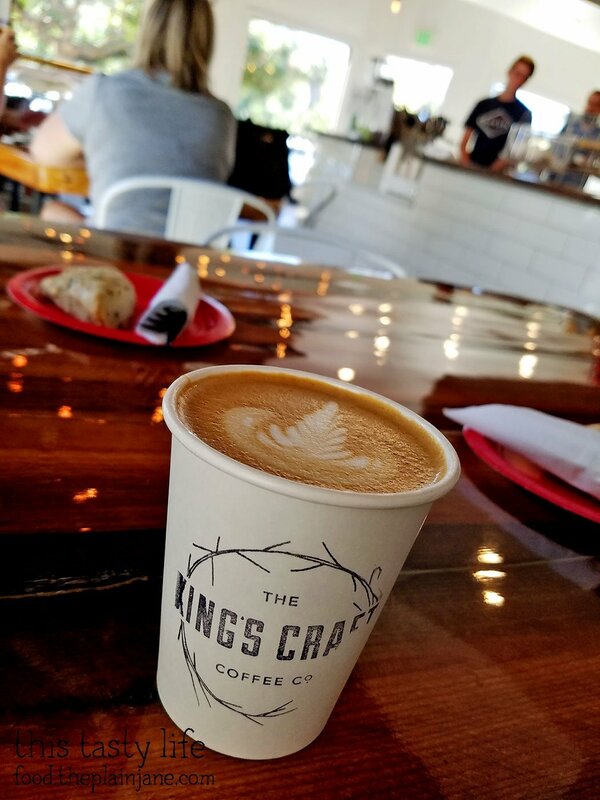 Earlier this month I was invited to come and check out a new coffee shop that had just opened in Poway called The King’s Craft Coffee Co. 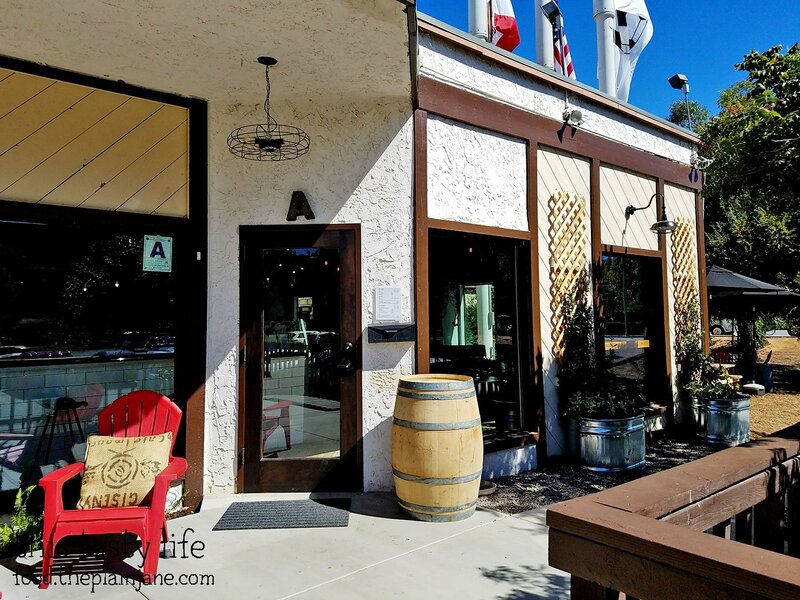 The new coffee shop is owned by former Chargers player Cory Withrow and his wife Monica. 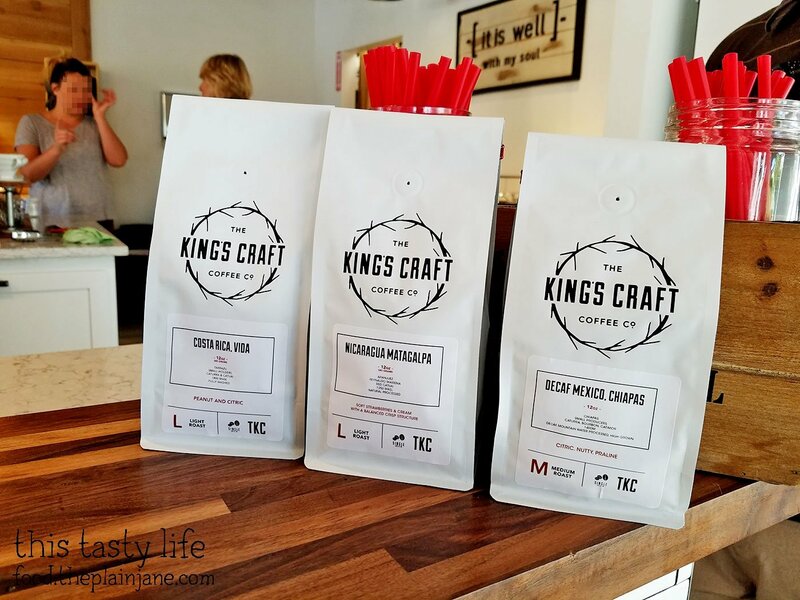 We were invited to come into the shop to try it out and see what the King’s Craft Coffee Co. is all about. 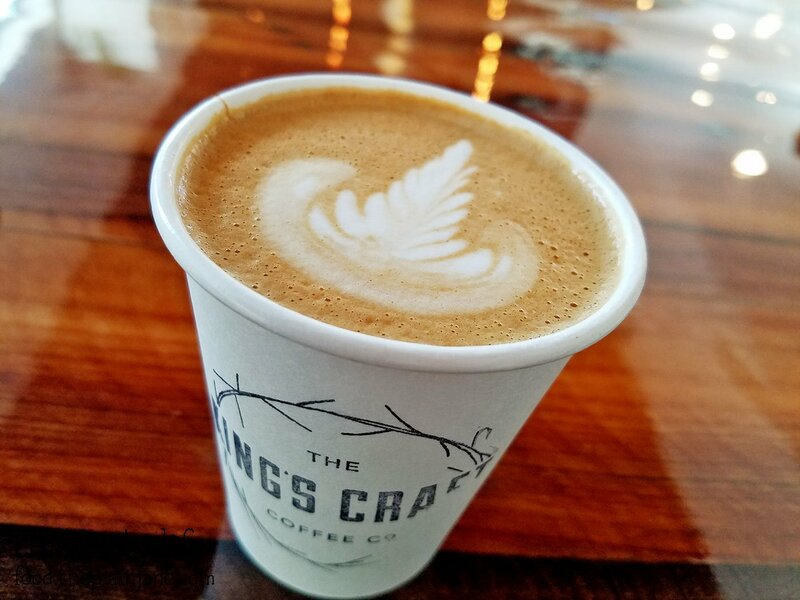 First off, The King’s Craft Coffee Co. is a bit deeper into the heart of Poway. It’s located in kind of a rare spot since it’s right next to a soccer park. Jake and I passed it on our first try since we didn’t think a coffee place would be next to a soccer park! There are these banners that can help you pinpoint the location. 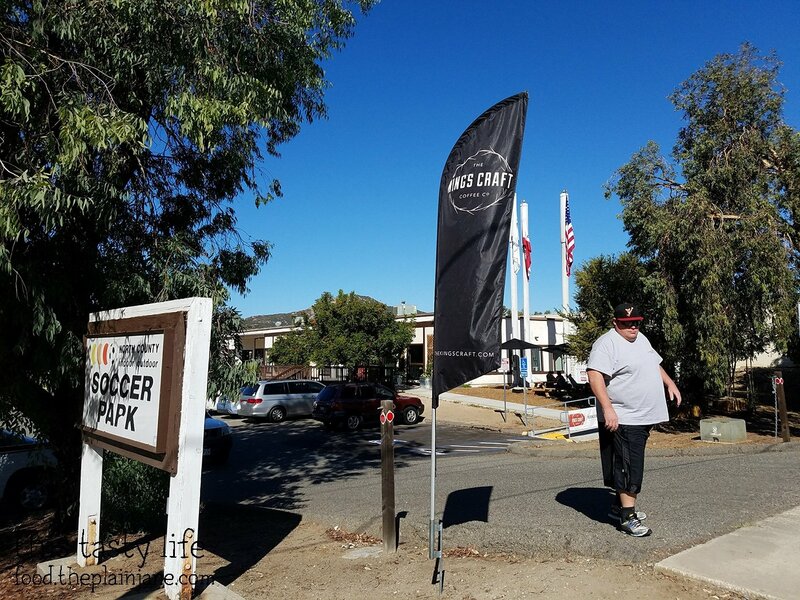 Be forewarned that sometimes the parking lot is busy on the weekends with all of the soccer games going on! There’s also street parking if the lot just happens to be full. 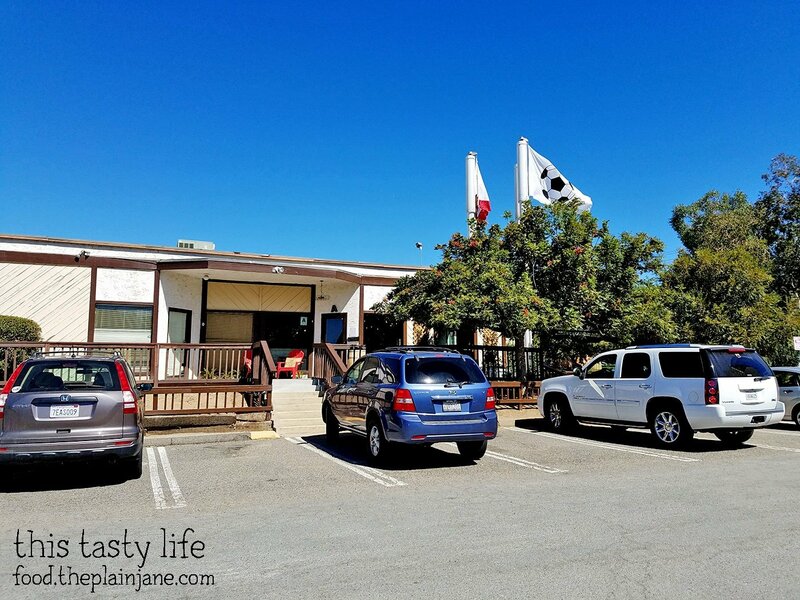 Here’s what the coffee shop looks like from the parking lot – it’s just up those stairs. Here’s the very front of the shop. On the side of the coffee shop they are building up an outdoors area with a few tables and chairs. Cory hopes to someday get a stage build for live music. 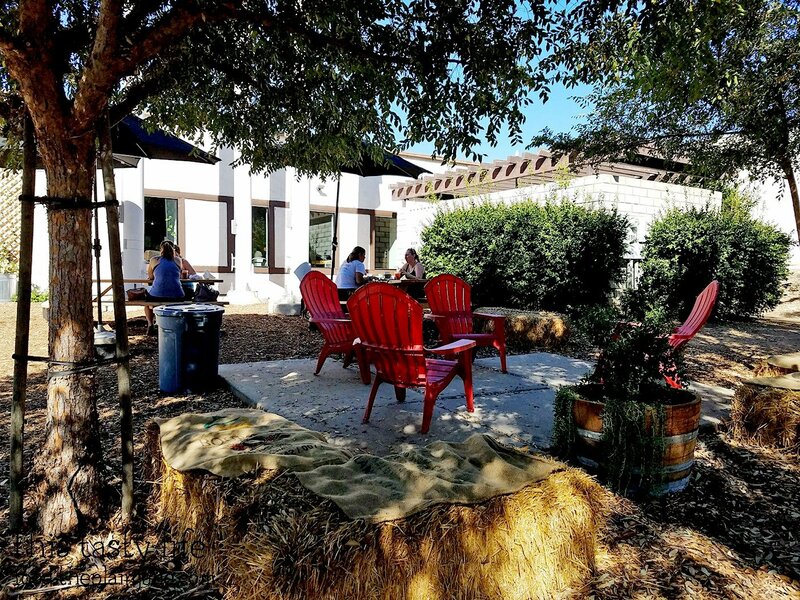 I really liked that they had outdoor seating – that means you could bring your furry friend along with you for some coffee and treats. 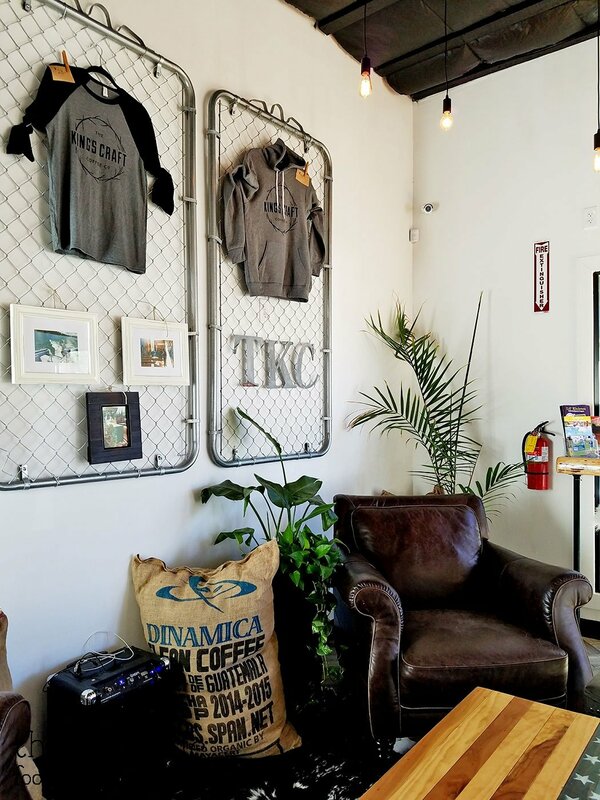 The interior of the King’s Craft Coffee Co. has a really nice, clean, and modern feel to it. Everything is simple and tasteful. I dig the hanging lights. 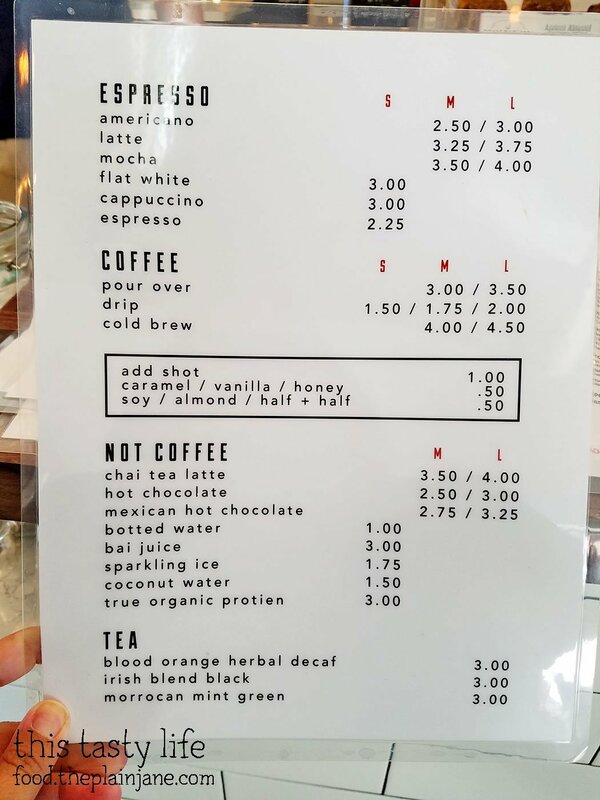 Here’s the drink menu for The King’s Craft Coffee Co. It amuses me that one of the sections is called “Not Coffee”. 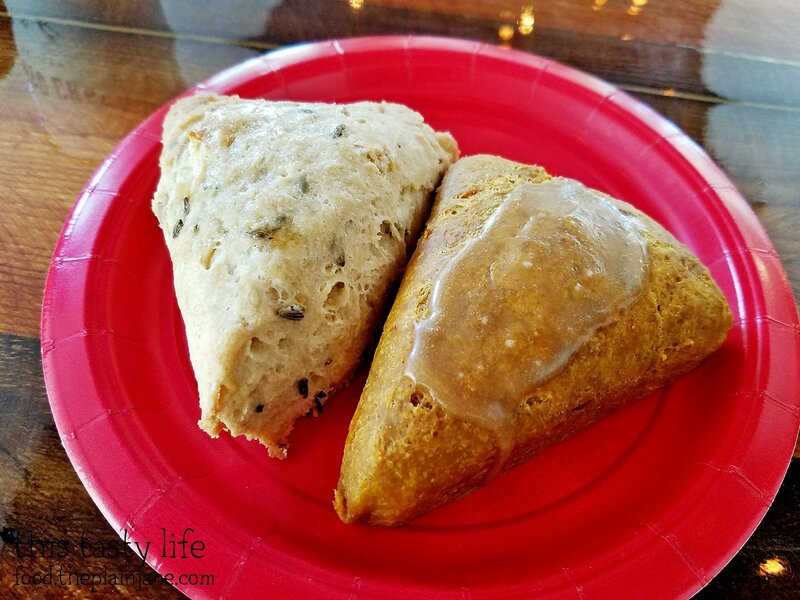 The baked goods and food at The King’s Craft Coffee Co. are all provided and made by Mindful Treats so you can have a little bit of food with your coffee. 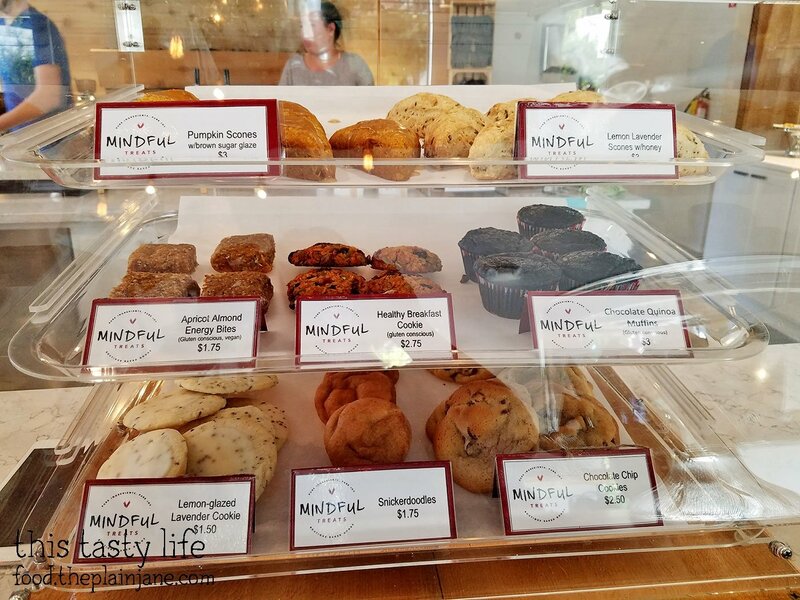 The owner of Mindful Treats is a family friend to the Withrows. Their kids participated in sports together! 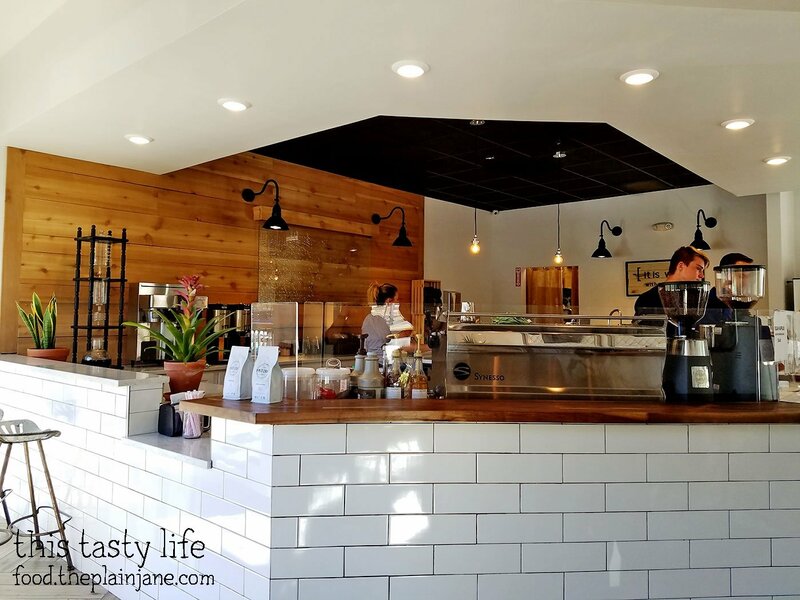 The owner makes a commitment to make freshly made and healthy treats. A few items are vegan and a few are gluten conscious. 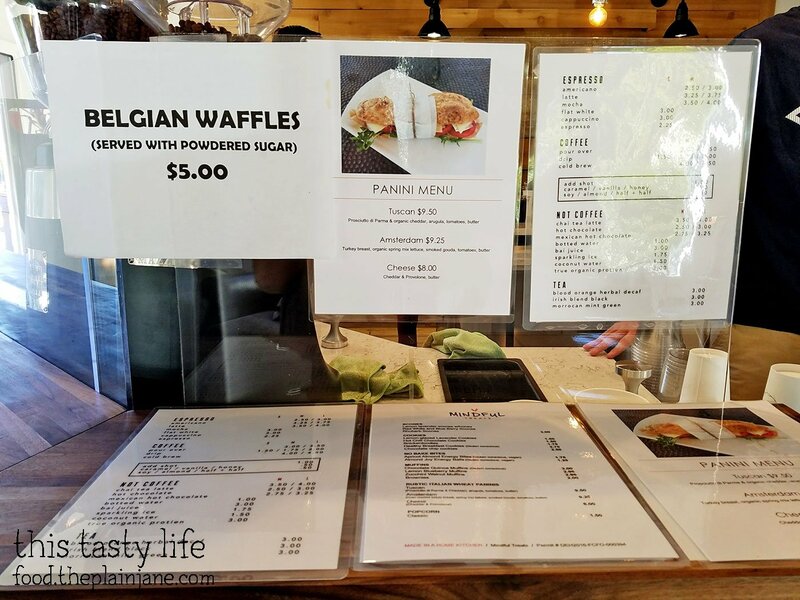 In addition to baked goods, there are waffles and paninis. 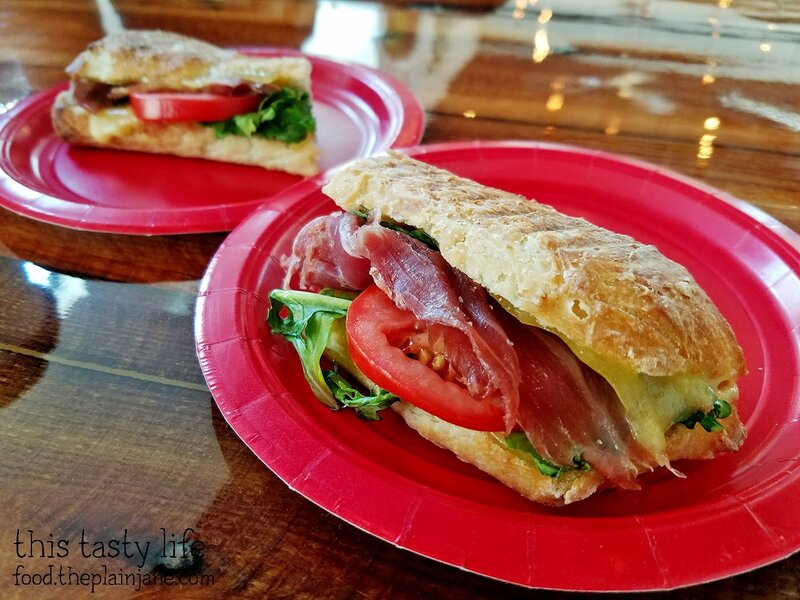 The bread for the paninis is made fresh every day! Here’s a visual on a few of those baked goods! I decided to start off my day with a Flat White (which is microfoam and espresso), a drink that I’ve taken a liking to. I’ve realized how much coffee I can have before my stomach protests and I try not to overdo it to appease my poor little stomach. The flat white comes in a small paper cup with some cool foam art on top. Usually when I have coffee I add a little bit of sweetner to it but I find that more and more I don’t always need it, as long as the drink doesn’t have a bitter aftertaste for me. Happily this Flat White fit the bill on that one as I didn’t taste any bitter flavor – it was a smooth, rich flavor with a nice balance of foamy milk and espresso. I don’t usually review coffee since drinks are harder for me to describe but I did enjoy this one. No sweetener needed, good bold flavor, too. I actually revisited over the weekend and got this same drink once again! Jake doesn’t like coffee so he opted to get a Mexican Hot Chocolate. I liked how frothy it looked! 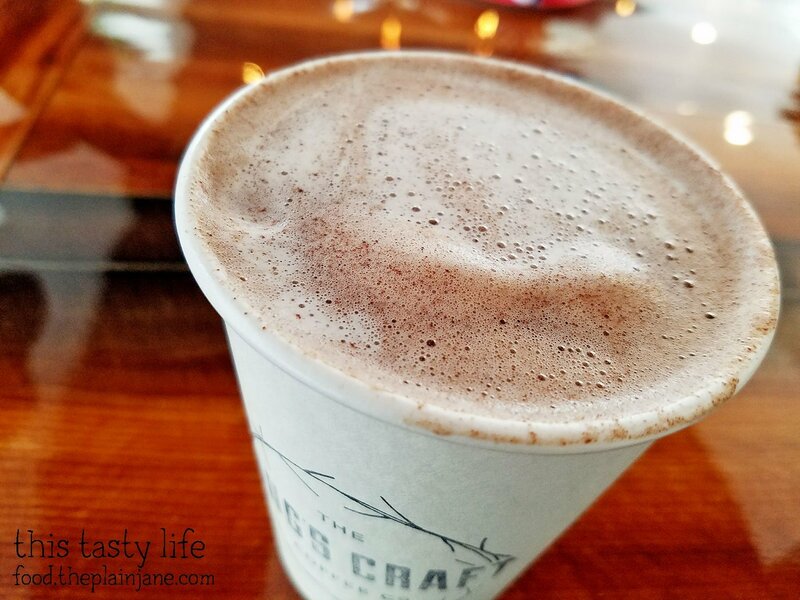 The hot chocolate had a great flavor – you can taste that bit of cinnamon and it wasn’t overly sweet at all. There was a mild sweetness to it so you could enjoy the drink without hurting your sweet tooth. Really wonderful aroma and taste! We were both impressed how tasty this drink was. 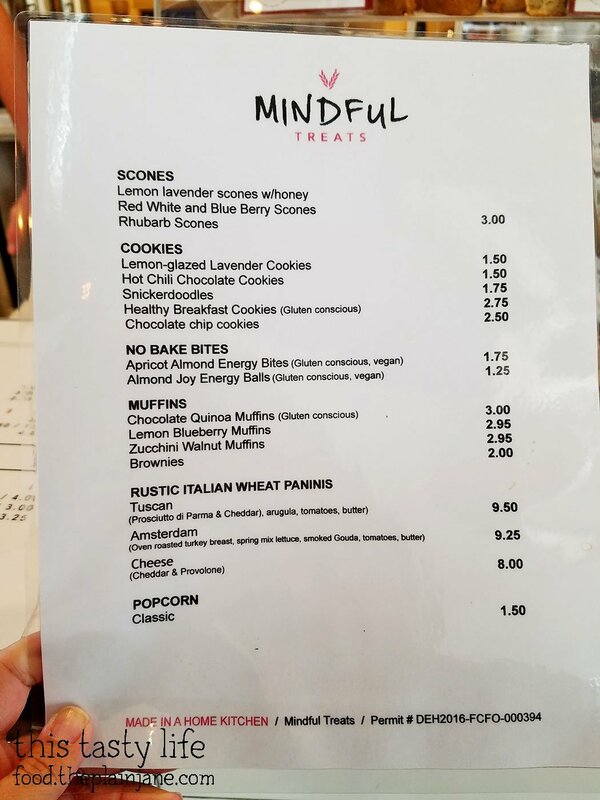 Jake and I also tried out a couple of food items by Mindful Treats. We started out with the scones. 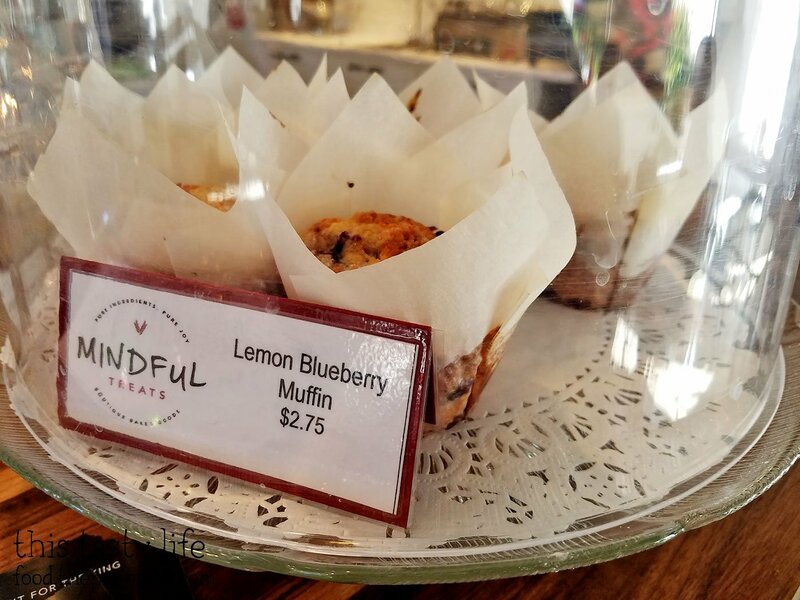 What I liked about the baked goods we tried from Mindful Treats is that nothing was overly sweetened. Looking at this scone you might think it would be quite sweet with the glaze on top but it wasn’t. There’s a light pumpkin flavor here and a touch of sweetness from the brown sugar glaze. It had a nice crumb and a good mouthfeel while you ate it. We both enjoyed this scone. 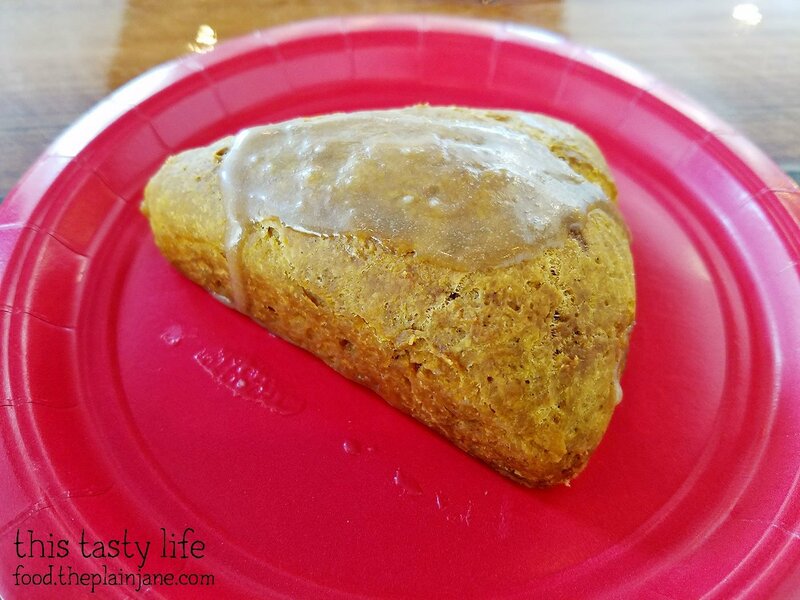 This scone was a bit more savory than the pumpkin scone. The smell of lavender hits your nose as you take a bite but the flavor of lavender is not overpowering. I do admit I couldn’t really taste the lemon though – the lavender came through for me more than the lemon. 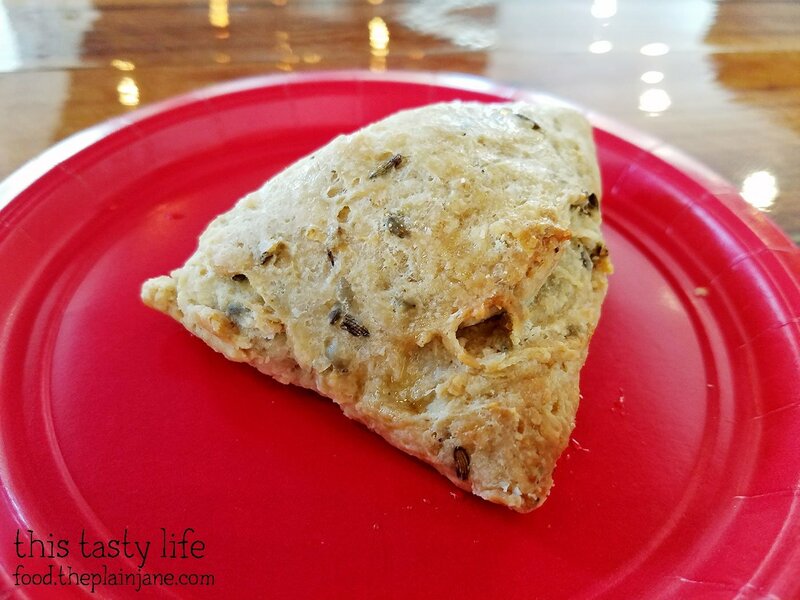 I enjoyed the more savory aspects of this scone. 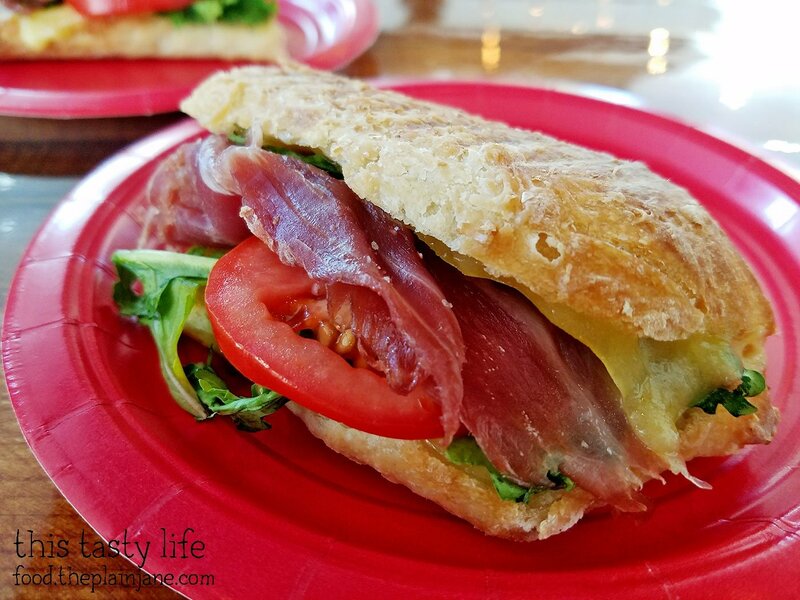 Jake and I split one of the Tuscan Panini sandwiches which comes with Prosciutto di Parma, organic cheddar, arugula, tomatoes and butter. The bread is WHERE IT’S AT on this sandwich! It’s a great crusty bread, with an excellent outer crust and a wonderful chew once you start munching on the panini. The bread is baked fresh every morning and you can really tell the difference in quality just from the bread! The mix of salty Prosciutto with cheddar was a good contrast on the sandwich. Yum, yum, yum! Jake and I loved this sandwich so much we tried to go get one this past Sunday but sadly they were ALL OUT before 11am. If you want to get your hands on one of these sandwiches on the weekend, I suggest going in early! Jake and I also shared a Belgian Waffle which are made to order. They have the dough ready and just pop it into the waffle maker so it takes a few minutes to prepare. The waffles are served with a bit of powdered sugar on top. 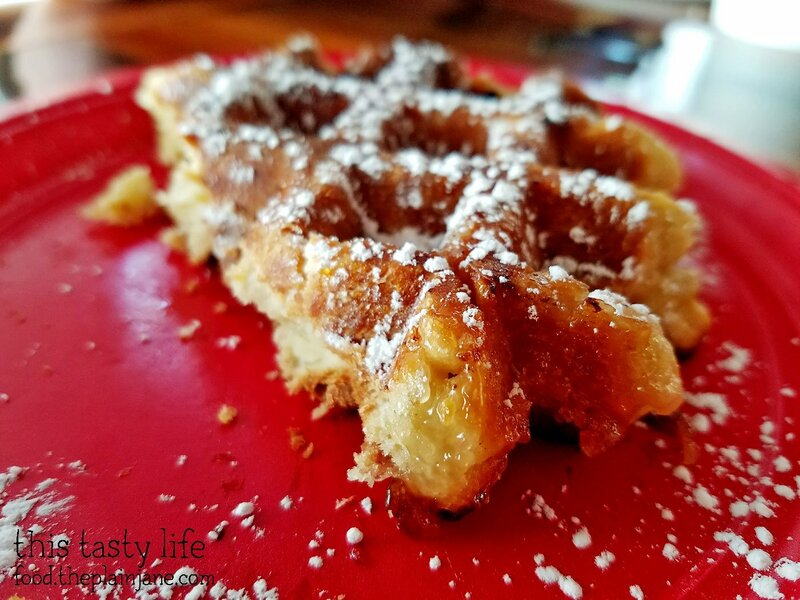 The hot waffle had nice crispy edges, a pleasant chew, and just a touch of sweet flavor in the waffle. 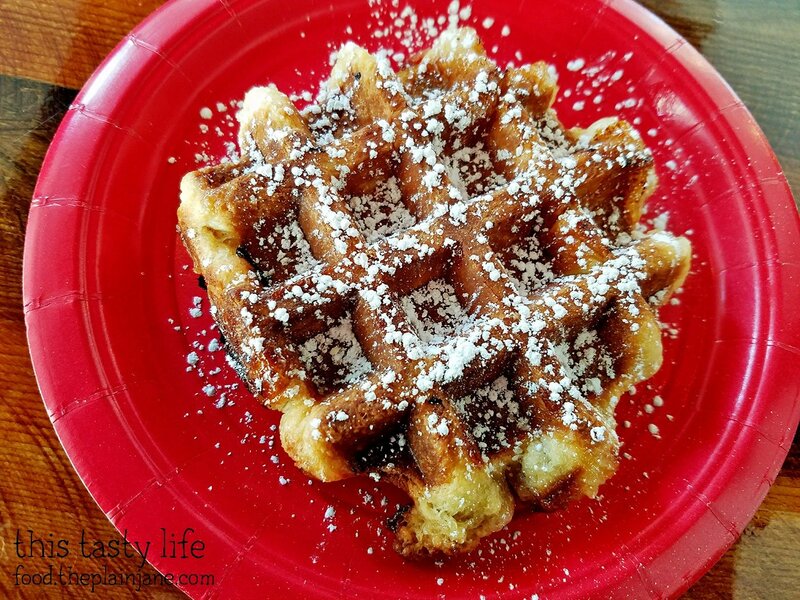 There are sugar pearls within the waffle so as you’re eating it, you come upon this little gooey centers of sugar that add lit bits of sweetness here and there while you’re eating it. I loved this! The waffle was nice little treat to eat with along with my flat white. I thought we were almost done with our visit when Cory was able to stop by and chat with Jake and I. 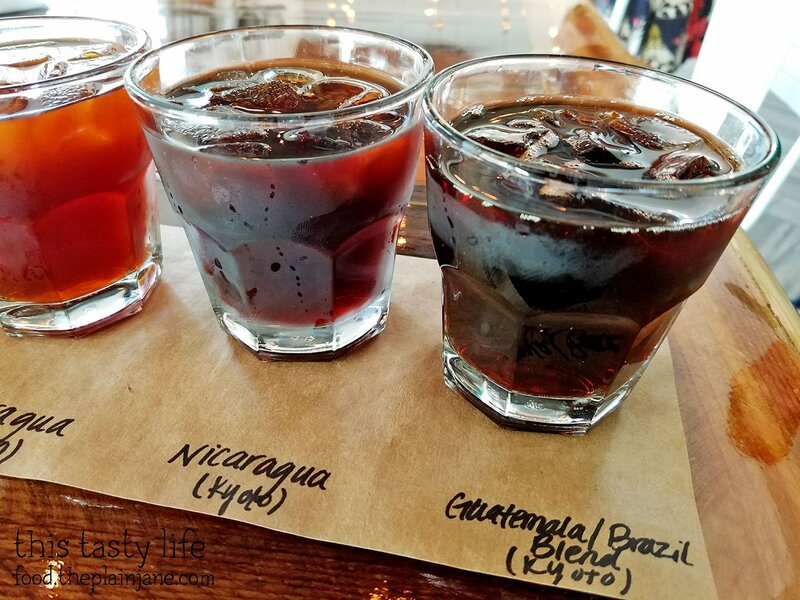 He brought over this special Cold Brew flight for me so I could sample their different cold brews. While talking with Cory about the cold brew coffee you could really sense his passion for coffee and for his shop. He started to geek out a little and got excited talking about he and another employee experiment with their cold brews. It was fun to see him he excited about something as simple as cold brew coffee and it was good to see someone so passionate about what they do. On the right were two cold brews on nitro and on the left the darker cold brews were made with the Kyoto process. Of the cold brews I tried, I preferred the lighter ones. The El Salvador was the smoothest one of the four and I tasted no trace of bitterness. There were toffee/caramel notes to this one with almost a slight nutty flavor. 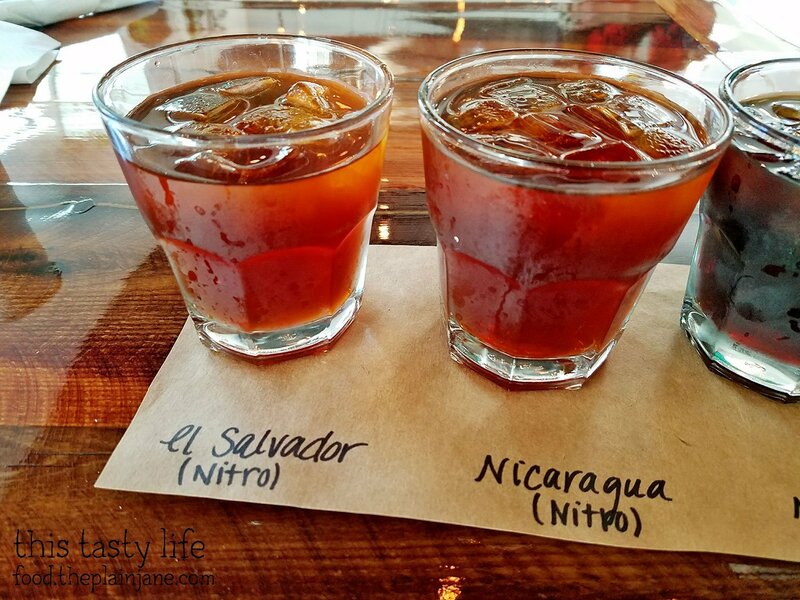 The Nicaragua was a bit fruiter than it’s counterpart and also had a unique flavor. These two were much bolder in flavor. The Guatemala was very strong and robust and a bit too much for my “I like milk with my coffee!” sensibilities. I’d definitely need to tone it down with milk and sugar to be able to fully enjoy it so that’s a cold brew for someone who likes strong, bold coffees. I had a few sips of each cold brew PLUS that flat white so not long after our visit I felt JITTERY. The caffeine level was high and I even felt a little shaky – I’m definitely not used to drinking that much coffee in one go! Happily I had no tummy problems, either, despite having had all that coffee. Yes! 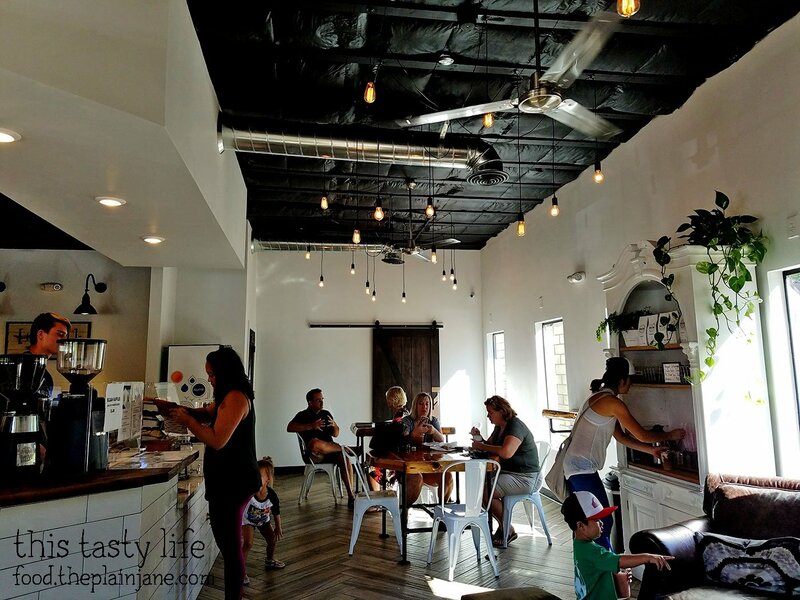 All in all Jake and I were quite impressed with the King’s Craft Coffee Co. Cory and his staff are committed to becoming a centerpiece of the community in Poway. The coffee is great, the food is wonderful, and I can really see this place becoming a regular hangout for many in the community. Jake and I just gotta return earlier in the day so we can get our hands on another panini sandwich! The King’s Craft Coffee Co.
Disclaimer: I was invited to come into the King’s Craft Coffee Co. on behalf of the shop. Our drinks and food were complimentary. I was not further compensated for this post and all opinions are my own. Very nice! I’ll have to make a trip up. The only thing missing from their coffee menu is a macchiato and a cortado. Those are the espresso based drinks that I prefer since the espresso to milk ratio is low compare to lattes (which I hate) and cappucinos. 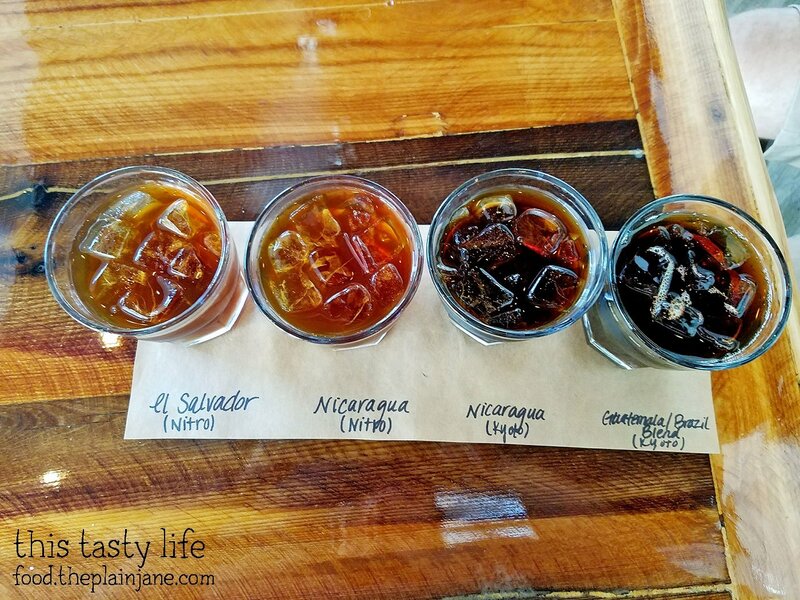 The cold brew flight looks good too. I would probably like the darker ones. Hi CC – Yeah, you would probably like the darker ones. I like it a litttttttle less bold haha. I was luckily able to sleep that night. I had the coffee early in the day and didn’t have any other caffeine that day so I was good. I hated feeling jittery though, ugh! If you go try and go earlier so you can get one of those sandwiches!